The U.S. Department of Health and Human Services Health Resources and Services Administration will host an event with UNC Global Women’s Health faculty Dr. Groesbeck Parham on Jan. 14, 2019 at 10:30 a.m. The presentation is accessible through live stream at this link. 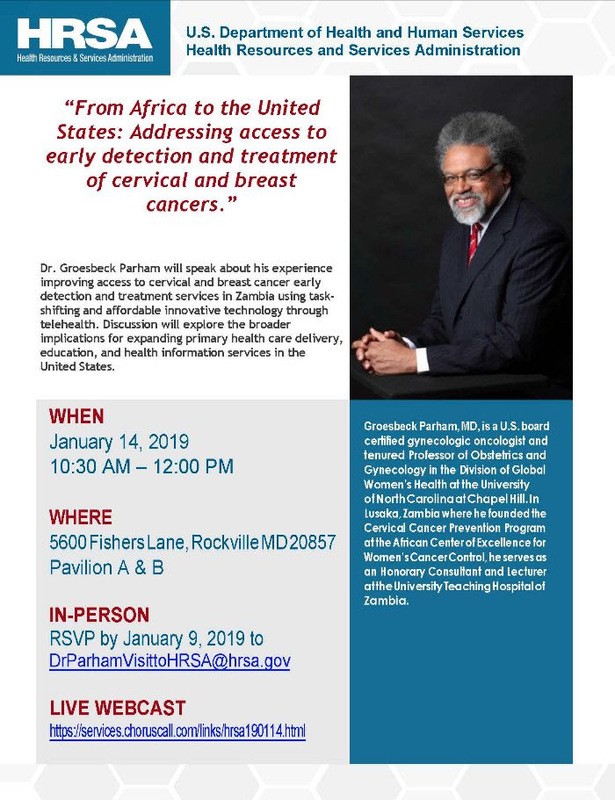 In his presentation, “From Africa to the United States: Addressing access to early detection and treatment of cervical and breast cancers,” Dr. Parham will discuss his experiences improving access to cervical and breast cancer early detection and treatment services in Zambia. Groesbeck Parham, MD, is a professor of obstetrics and gynecology in UNC OB-GYN’s Division of Global Women’s Health. He lives and works in Lusaka, Zambia where he founded the Cervical Cancer Prevention Program at the African Center of Excellence for Women’s Cancer Control.